Moving is one of the more stressful events in a person's life. Yes, it's exciting, but it's also a disruption of your life's routine. When relocating, it's important to minimize stress as much as possible. I've been trying to implement some stress-relievers in my life as we go through the process of moving. It's been tough. My go-to reaction is to lay awake at night fretting over every last detail, letting the idea "what if" consume my every thought. The thing I've found most helpful in calming my nerves is making a calendar. Listing all of the details & scheduling them into these last few weeks before we leave has allowed my mind to breath a little bit. Knowing that everything will get done & can get done in a timely manner has helped a lot. Plan ahead: Like I said, it's all about the plan. Don't wait until the last minute to get your affects in order. Once you have decided to move, make a schedule of the tasks that have to be completed before you leave (packing, renting a truck, finding an apartment, etc.) & space them out. If you schedule & plan ahead you'll save yourself a lot of stress. Save ahead: Planning ahead also applies to saving money. Heather & I have spent the past year saving for this move, & while that meant doing NOTHING FUN for 12 months I wouldn't take that decision back. Moving, if you haven't heard, is expensive. Save more than enough money for a moving truck, gas, rental & pet deposits, hotels (if it's longer than a day's drive), utility deposits, & emergencies. There will always be unexpected expenses. Plus having a little saved up really alleviates stress because it's one more thing you don't have to worry about. Rent your truck ASAP: Once you have picked a date, rent that truck! 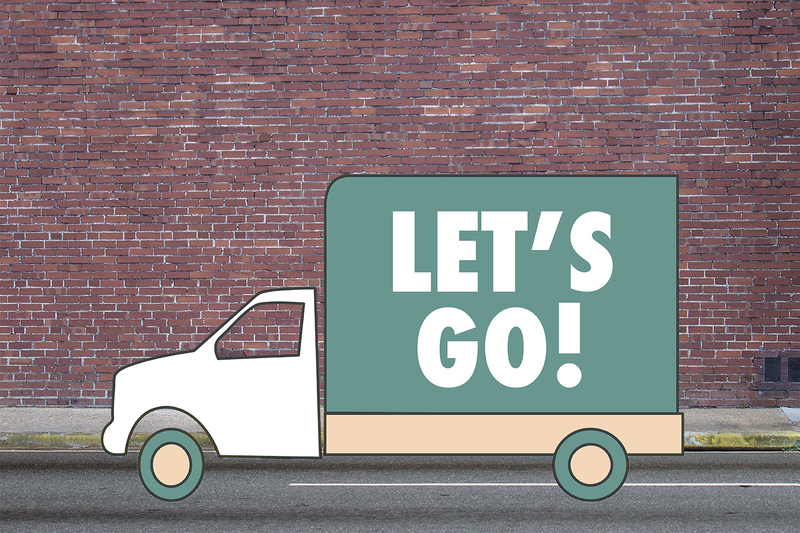 Securing a truck will be less-stressful than trying to wrangle one closer to your moving date, & you also may not be able to rent the truck you want if you wait. This is especially true if you are moving in the summer - everyone moves in the summer, so lock that truck down. Since we were moving such a long distance with pets we wanted to look at the various models to make sure we were getting a vehicle that would fit us all. We didn't want to be surprised the day we picked the truck up! You can totally ask to see the truck ahead of time. When picking a truck also consider whether you will be towing your car behind it - not all trucks have this capability. You also want to check with the truck rental company as to their securing policy. Some companies will not 100% secure the truck for you - cover all your bases. Pack ahead: Don't save all the packing for the week before you leave. You can pack away things you don't use as frequently (i.e. holiday decorations, books, wall art, out-of-season closing, personal keepsakes, etc.) way in advance. Pack a "Go Bag/Go Box": This is where you store all the items you will need along the move & right when you arrive at your destination. Your "Go-Bag" should include personal items like toiletries, clean clothes, tampons (seriously, you don't want to be rummaging through boxes looking for those), toilet paper (see previous statement), etc. Your "Go-Box" should also include cleaning supplies for last-minute cleaning of your previous residence & for any cleaning that's needed in the new residence, as well as trash bags, cutlery, & dish ware for when you arrive. If you're traveling with pets, include pet food & toys, & a litter box for the felines. Trust your gut: While moving can be scary, go with your gut in terms of decision-making. Remind yourself that people do this all the time. Make a plan & go for it. You can do it! Related // More thoughts on eliminating stress by taking it easy.